We focus first on two omnipresent dimensions of human life: space and time. Their very pervasiveness, however, sometimes renders their precise influence elusive. It is not common to find them as chapter headings in books such as this one. Therefore, our gathering of knowledge under these headings as organizing principles for usable knowledge is unorthodox and sometimes speculative, but also, we hope, novel at times. We notice initially an apparent paradox. Time and space can be regarded as both universal and unyielding but at the same time manipulable by humans and therefore culturally and socially variable. They are universal in that both have to be confronted as existential conditions of life. All actions occur in space, and space is forever an obstacle to complete freedom of movement. The same can be said of time. Furthermore, the rhythms of nature (diurnal, seasonal, annual) and body processes (e.g., menstruation, reproduction, generations, life-cycle regularities, and death) impose themselves (Silverman, 2001). Yet there is enormous personal, social, and cultural variation in representing both space and time, as anthropologists and others have demonstrated (Levinson, 2001; Gell, 1992). Both are also objects of endless symbolization, as revealed in expressions such as social time, political time, ritual time, geographic space, social space, personal space, and symbolic space. It is essential to keep this double aspect of universality and variability in mind. Space and time are represented differently in the social-science disciplines. Geography is most explicit in its incorporation of space; place arrangements, distribution of populations, and movement in and constraints of space have been at the center of that discipline (e.g., Pred, 1973). Urban studies, planning, architecture, and design deal explicitly with spatial arrangements, as does social ecology. Even though much of neoclassical equilibrium theory is presented as "timeless" (Vickers, 1994), economists explicitly refer to time in discussing topics such as interest, investment, inventory cycles, business cycles, and economic growth, and consider space in the analysis of markets and location theory. Sociologists acknowledge a sociology of time, and a few write about it (Sorokin, 1943; Gurvitch, 1964; Zerubavel, 1981). Anthropologists have analyzed the centrality of time in political contestation and the exercise of power (Rutz, 1992), as well as the apparently universal relationship between space and a sense of belonging (Lovell, 1998). Psychologists write on how individuals organize their own sense of space (Eliot, 1987), on neuropsychological mechanisms involved in temporal processing (Pastor and Artieda, 1996), and on ways of experiencing time over the life cycle (Levin and Zakay, 1989). Demographers take time and space into consideration in analyzing trends, generational and cohort effects, migration patterns, and the aging of populations. At the same time, these two variables have limited visibility in these disciplines. If one examines the list of "sections" of their professional associations, there are no subdisciplines or sections with the names "psychology of time," "sociology of time," or "anthropology of time" among their dozens of subspecializations, and there is a similar lack of explicit reference to space as a category. Despite this semihidden status, social scientists have recognized the power of these fundamental dimensions of human existence, incorporated them directly into their research, and produced relevant and usable research findings. In this chapter, we draw together a sample of their results. More than six decades ago, three psychologists, all later to become very distinguished, published a study (Festinger, Schachter, and Back, 1950) of social dynamics in a housing project for married veteran graduate students at the Massachusetts Institute of Technology. They focused on small friendship groups and cliques, norms, conformity, and deviance. They employed a method (sociometric analysis) favored at the time and since reborn and employed under different names in network analysis (see chapter 4, pp. 00-00). Using that method, the investigators simply asked respondents about whom they saw socially and whom they liked and disliked. Then they proceeded to construct sociometric maps of friends, "stars," and isolates. Earlier Stouffer (1940) had written about the importance of space in social life in general: "Whether one is seeking to explain 'why' persons go to a particular place to get jobs, 'why' they go to trade at a particular store, 'why' they go to a particular neighborhood to commit a crime, or 'why' they marry the particular spouse they choose, the factor of spatial distance is of obvious significance" (845). The authors of the MIT study were especially interested in the principle, well established in the literature, of residential propinquity in marriage-an inverse relationship between the residential distance between potential marriage partners and frequency of marriages. In a word, space appears to play a central role in the opportunity structures people face. Some economists and economic geographers incorporate spatial barriers into notions of transaction costs-e.g., how much does it cost to move people and commodities from point A to B? Each building of the housing project was spatially arranged as a number of apartments on two floors, with exits from the second floor available only by stairwells leading to the first floor at each end of the building. These arrangements alone dictated in large part the "passive contacts" among residents: that is, meetings that occurred in the daily rounds of coming and going. The investigators assumed further that frequency of passive contacts would facilitate speaking relationships, acquaintances, and friendships. The findings were striking. Mere physical distance between apartments proved to be a predictor of friendships. Those living in the same building had more friendships with one another than with those living in different buildings. Those living on the same floor had more social relationships with one another than with those living on different floors. Those on the first floor who exited onto the courtyard frequently ran into others while entering and leaving their residences, and friendships clustered among them as well. Those who lived at the ends of houses with exits directly facing the street were involved in fewer friendships than those who faced an open courtyard. Those living in apartments on the first floor at the base of the stairwells had more friends among those from the second floor (who passed by their apartments going to and fro) than did those who were isolated from the stairwells. While other factors, such as personal compatibility and not having or having children of the same ages, were also determinants, spatial contiguity retained a central role. Festinger and his colleagues also traced the evolution of friendship patterns into enduring cliques-along with their features of conformity, social pressure, and deviance. These, too, followed the spatial contours of the housing project. The principles demonstrated in this research are evidently generalizable to other settings: housing in college dormitories, placement of recruits' bunks in basic training, cell assignments of inmates in prisons, classroom seating arrangements, closeness of workers to one another on assembly lines, and nearness of desks to one another in offices. Summarizing research on physical proximity in workplaces, Sundstrom (1986) noted that "people in factories and offices choose to converse with their closest neighbors and make friends with them" (262). He also noted the social (as well as practical) drawing power of "activity nodes," such as corridors, water fountains, bulletin boards, coffeepots, computer terminals, and vending machines (ibid. : 263-78). More generally, when one moves from one neighborhood to another, one begins to shop in different places, take different walks, bank at a different branch, and, over time, visit with nearby new friends more than now-distant old ones. With respect to the encouragement of informal associations, we should also mention the social wisdom built into university commons rooms and lounges, common residences such as fraternities and sororities, the clustering of lockers in the halls of high schools, neighborhood parks, the placement of coffee machines and water dispensers in offices, and even the location of employees' mailboxes. Recent studies (e.g., Hipp and Perrin, 2009) have reaffirmed the impact of different kinds of distance on network ties: the greater the physical distance, the weaker the ties; the greater the social distance (as measured by wealth), the weaker the ties. A few different, though related, observations: Throwing people together in spatially isolated settings-ocean voyages and rafting trips, for example-magnifies the development of intense, short friendships, most of which dissolve as these groups disperse. The spatial ecology of cities, hinterlands, and rural areas dictates in part the loci of market exchange and travel patterns. Residential segregation by race and class produces spatially based slums, ghettoes, suburbs, exurbs, and pockets of gentrification-and transitional zones among them-all of which contribute to differing exposure to personal danger, environmental contamination, quality of medical care, and educational opportunities, as well as endogamous acquaintance, friendship, and marriage patterns (Massey and Denton, 1993). A further, negative example confirms this centrality of space and time. In the late 1980s, Smelser was asked to evaluate the sociology department at Sonoma State University in Cotati, California. In visits with the chair, he learned that she had been concerned for some time about anomie among students in the department. Some of them complained of impersonality, inaccessibility to faculty and other students, and lacking a sense of belonging. Some years earlier, in an enlightened moment, she had managed to beg resources from the university administration to set aside space for a conveniently located commons room complete with easy chairs, a small library, coffee, and open doors. The experiment was a failure. Almost nobody came. The reasons for the failure, moreover, were other space-and-time considerations affecting the students. Since this was not a residential college, many of them commuted from a distance, many worked part-time or full-time, and many were married with children. Most simply drove to the campus for classes or meetings with faculty, then departed to run errands or go home. So while the students might have continued to feel isolated and alienated, their own, more important space-and-time exigencies defeated the space-time experiment designed to make them feel more at home. One further point about the pervasiveness of space. We mentioned the anthropological work linking space and a sense of belonging. Even in a presumably neutral living place such as the MIT housing project, the residents had a definite sense of residing in a spatial unit and expressed varying degrees of satisfaction about living there (Festinger, Schachter, and Back, 1950: 30-40). More generally, space is a fundamental defining element of people's expanding circles of belonging and identity-their rooms, their homes, their gathering and loitering spots (Whyte, 1943; Liebow, 1967), their neighborhoods, their communities, their cities, their athletic teams (often identified with and named after spatial entities), their regions, their nations, and, in a weaker way, their world or planet. The nation-state is above all a spatial entity with borders. With space comes territoriality, a trait shared with nonhuman species and one of the most fundamental driving forces in human life. Territoriality involves identification of boundaries, defense against intruders, aggression against outsiders, and sometimes expansion into others' territories (as in gang wars, regional competition, colonialism, aggressive wars, and academic imperialism). Like space in general, territoriality is capable of symbolic representation, as the phrases "personal space," "social space," and "living space" (Lebensraum) reveal. As we will observe in chapter 10, academic life is fraught not only with competition over physical space in the form of the size and location of offices and laboratories, but also with symbolic jurisdiction and defense of subdisciplines, schools of thought, and theories. While these illustrations establish the omnipresence of space and time in social relations, we should remind ourselves that these variables alone do not solely determine and perpetuate relationships. Kinship and friendship bonds motivate people to transcend spatial and temporal barriers in order to keep contact with distant others. Technological innovations such as the telegraph, telephone, and computer-to say nothing of the ease, convenience, and cost of travel-compress both space and time and permit continued contact at relatively low cost. Furthermore, as people's financial resources increase, they are more willing to spend those resources in traveling longer distances to visit loved and liked ones. Despite all this, the dimensions of space and time continue to matter. Later we will show how these ramify in many symbolic directions, including the symbolization of importance, status, and authority, and in that way constitute bases for individuals' satisfaction and dissatisfaction, as well as group conflict. In the wheel, the central member could communicate with everyone else in the group, but the others could communicate only with the central member. The wheel and the Y are centralized, and the chain, circle, and all-channel are decentralized. In the experiments, communication was controlled by having the subjects pass notes to one another through slots between cubicles. Participants in the wheel and Y patterns reached solutions faster; in the circle and other groups, people sent more messages and made more errors. • Centralized networks perform more efficiently (faster and with fewer errors) than decentralized ones. • Decentralized networks send more messages than centralized ones. • Centrally located members in centralized groups emerge as leaders, whereas no leadership patterns emerge in decentralized networks. • Decision-making in decentralized groups are arrived at by slow consensus-building, whereas in centralized ones messages are passed to the leader and decisions announced. • Members in decentralized groups express more satisfaction with the experiments than those in centralized ones, though centrally located members in the latter express high satisfaction. These differences can be traced to the degree of participation and responsibility experienced in decision-making processes. 1. The telephone conference call, in which both space and time are radically compressed. Often designed as task-oriented committee work, a conference call has a structure of communication that combines the all-channel and the wheel principles. All participants have access to one another, but there is typically a "chair" for the call, which places him/her in a central position. The participants are usually not anonymous. Because they are not visible to one another and their voices cannot always be recognized, however, special means of identification are sometimes called for, such as speaking one's name at the beginning of an intervention. Also because of the lack of eye contact, gestures, and other face-to-face communication, special conversational rules develop for initiating, turn taking, interrupting, and finishing, sometimes evolving unconsciously and sometimes engineered by the chair of the call. Emotional expression is limited to verbal forms, and for that reason is not as rich as in face-to-face meetings. Finally, in conference calls it is easier for participants to engage freely in other activities, such as reading mail or simply zoning out if bored or unengaged in the business of the call. We know of no systematic research on the relative performance level, efficiency, and satisfaction levels of conference calls, but we suspect that they complete their work faster and are affectively more neutral than face-to-face committee meetings, even dull ones. 2.Videoconferencing. This form of communication is more varied than the typical conference call. Sometimes it is similar in structure, with space and time compressed, but because vision is possible, it can be placed somewhere between invisible and face to face. Often, however, a videoconference is a meeting between two groups at different physical locations, thereby calling for a more complex communication structure. Some leaders or central persons in the system of communication are called forward to monitor interventions, move the meeting along, offer summary suggestions, call for or indicate consensus on specific items, and suggest when the meeting is approaching the end of its work. 3. E-committees. Later in the chapter we will take up the general topic of electronic communication, which an extreme compression of time and space dimensions. At this moment we mention only one type: committee work by computer. We offer two impressions based on our own experience. In various e-committees on which we have sat, we have developed the impression that the chair of the committee probably has a degree of power greater than he or she would in standard face-to-face committees. While in principle all members can communicate with all or some others at any time, in practice they do not bother to do so. The chair initiates communications, receives input, digests it, informs members of tentative or final conclusions, and typically deals with individual members on refinements or wording of the committee's conclusions. This dynamic resembles the classic circle or Y patterns even when chairs are committed to including everyone in the proceedings. This centralization appears to derive in large part from the medium. We should also mention a peculiar type of e-group, an all-channel decision-making structure without any leadership. An example serves best. When Smelser was director of the Center for Advanced Study in the Behavioral Sciences at Stanford in the late 1990s, it was the custom for each class of forty to fifty fellows to decide on a collective gift for the center in appreciation of their year of scholarly freedom. Normally a small gift committee chosen by fellows processed the decision and produced a recommendation, usually acceptable to and welcomed by the center. The director did not intervene in the committee's deliberations except occasionally to veto an outrageous suggestion (such as an espresso machine, which was anathema to the kitchen staff, who would have had to clean up around it several times a day). One year the gift committee decided to go fully democratic and ask everybody to make suggestions and to circulate every suggestion to all forty-five other fellows by using email's "reply all" option. Within less than a day this process fell into chaos. Many fellows responded to others' suggestions by pointing out that they were good, not suitable, or outright stupid, and sometimes offered countersuggestions, always sending the message to "all." The result was a muddled flurry of suggestions, all ventured in a mass way, without any machinery for deliberating or reaching consensus, that produced some flaming, counterflaming, insulting, and wounded feelings. At a certain moment the director had to intervene with a message to "all," announcing that matters had gotten out of hand and that the gift committee should reconstitute itself and proceed along more conventional consultative lines. The lesson: It is difficult to reach a structured decision without a structure, and it is easy to lose control in a free-for-all communication setting. One lesson deriving from many lines of social-science work is that the human being is a symbolizing animal. The extent of symbolization is without apparent limit; almost anything can be a symbol for something else. Once a symbol is created and fixed, furthermore, it can become the object of personal affection and identity, as well as a source of symbolic wounds, often as real in their consequences as physical wounds. We refer to this general principle from time to time, but limit ourselves to a few observations on space and time symbolization in this section. Those who control a given space in a workplace also make symbolic use of it. Who travels to whose office for a meeting typically symbolizes the superior power or status of the one who hosts. If the superior goes to the subordinate's office, this may communicate a symbolic message of equality or friendship. An office person attempting to influence a client may move from behind his or her desk and sit next to the client, symbolizing equality and friendliness; he or she may also use the desk to symbolize authority and distance from subordinates by sitting behind it. In committee and board meetings, who sits to the right or left of-and how far from-the boss typically corresponds to the rank, authority, and status of the members attending. Alternatively, if leaders are interested in promoting equality or a participatory culture, they may strive to symbolize that equality in spatial ways such as identically sized cubicles for all or randomized circular seating in meetings. Finally, those in workplaces turn space into extensions of personal identity through adornment with their own special coffee mugs, photographs of family, and other memorabilia. That these, too, are important is revealed in the resistance that often develops when superiors initiate neatness and "clean desktop" campaigns. It is a saying among real estate brokers is that the key to selling houses is "location, location, location." Some of this preoccupation may be practical-access to shopping, transportation, schools, and services. Another part is more symbolic and raises issues of location in the world of status. What kinds of shops and schools are nearby? What kinds of people live nearby and ride the buses? Is the neighborhood regarded as high, acceptable, marginal, transitional, or low in status? This volume is a one-of-a-kind contribution to applied social science and the product of a long collaboration between an established, interdisciplinary sociologist and a successful banking executive. Together, Neil Smelser and John Reed use a straightforward approach to presenting substantive social science knowledge and indicate its relevance and applicability to decision-making, problem-solving and policy-making. Among the areas presented are space-and-time coordinates of social life; cognition and bias; group and network effects; the role of sanctions; organizational dynamics; and macro-changes associated with economic development. Finally, the authors look at the big picture of why society at large demands and needs social-science knowledge, and how the academy actually supplies relevant knowledge. Neil J. Smelser is a senior scholar and University Professor at the University of California and author of several UC Press books, most recently The Odyssey Experience and Reflections on the University of California. John Reed is currently Chairman of the Corporation of MIT and former Chairman of the New York Stock Exchange and former Chairman and CEO of Citicorp, Citibank and Citigroup. "Usable Social Science represents a remarkable collaboration between Neil J. Smelser, one of America’s most distinguished sociologists, and John Reed, a highly successful member of corporate America. 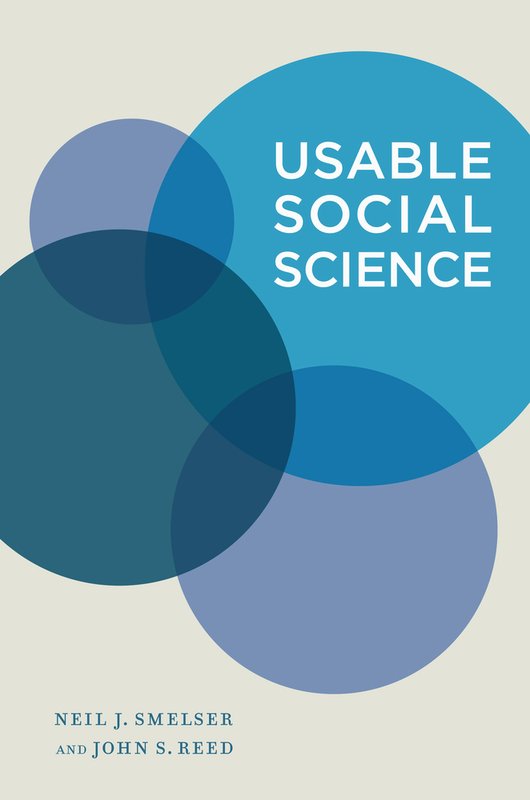 Together, they accomplish an even more remarkable feat of making accumulated social science knowledge accessible to non-academics while, at the same time, making an academic contribution to the social sciences by reviewing the history, accumulated findings, and conceptual approaches in key areas of specialization in sociology and elsewhere in the social sciences. "—Jonathan H. Turner, University Professor & Distinguished Professor of Sociology, University of California, Riverside. “This book is an ambitious project to provide the public with a review of the available and practicable knowledge for decision-making people (and who is not that today?) that the social sciences have produced over the last 250 years or so. Typically, such efforts are bound to fail. But this project is a full success, keeping its promise to present knowledge in an understandable and exciting way. The language is charming and the elegant prose is the product of a fluent, transparent style. In short: a must read!”—Hans-Peter Mueller, Professor of sociology, Humboldt-University of Berlin.